Have Books From Alexandrian Library Turned Up? 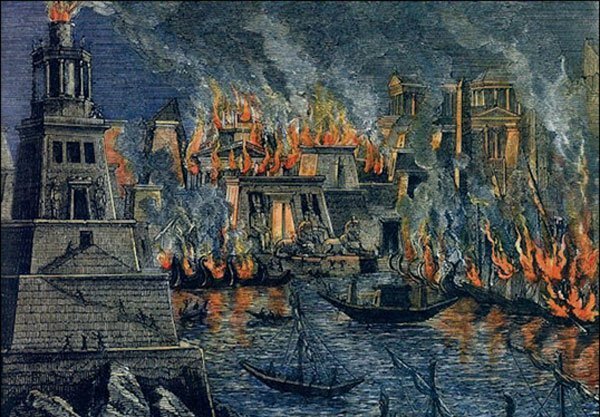 Among the greatest of historical tragedies was the destruction by the Romans of the University of Alexandria, Egypt, and the burning of its Great Library. That library was said to contain all of the written knowledge of the known world. It was burned in about 400 A.D. Stored there in two different buildings was a collection of carefully scribed manuscripts, scrolls and clay tablets, carefully gathered by Ptolemy I Soter, a successor to Alexander the Great. Within the walls of the Great Library were ancient documents that undoubtedly contained a clear picture of world history . . . something lost to mankind when the Roman army, under orders from the Christian Roman leader Theophilus, during his years as Patriarch of Alexandria from 385 to 412 AD, ravaged the university. At least that is one story. The destruction of these and many other records all over the world by Christian invaders opened the door to the superstitious religious blindness that prevailed through the Dark Ages and continues to influence historical and religious doctrine to this day. The documents were destroyed, but not all of them lost, however. It turns out that about 100 years ago, archaeologists sifting through an ancient rubbish dump in central Egypt came upon a cache of original papyrus documents. While suspected of being an important find, the documents appeared to have been lost to age and weather. They were not only decayed and blackened from age, but worm-eaten. The information written on the parchment was impossible to view. But the parchments were carefully preserved in the hope that new scientific methods would someday be developed for capturing the data. There is good news. After a century of waiting, a new photographic technique developed from satellite imaging, is bringing the original writing back into view. And what they are finding in that old rubble is astounding. The manuscripts are found to contain work by some of the greats of classical literature that include Sophocles, Euripides and Hesiod. A team from Oxford University is now pouring over the old text, now finding thousands of works of art and literature that have been lost to the world for 2000 years. Other works expected to turn up are writings by Ovid and Aeschylus, plus many of the lost gospels that present a more complete picture of the life of Jesus. Some scholars believe the uncovered text will mark a major increase in the number of great Greek and Roman works in existence. That so much information was so cold-heartedly burned by ruthless invaders of the ancient past is difficult for us to understand.